Director, Writer, and Actor Josh Mitchell’s latest film Lack of Cockery is due out next month. 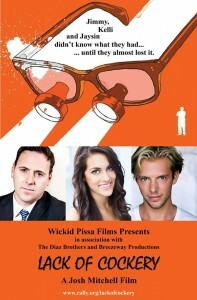 Josh again will star in his film along with rising actress Alethea Sholomenko and actor Mike Maolucci. Also starring in the film is the talented Dan Sutter who has been in numerous features and shorts. Keep updated with Lack of Cockery on the Facebook page and website. For more information about Josh and his project and if you want to see Lack of Cockery at your local film fest or interested in distributing the film please contact Josh through his website.